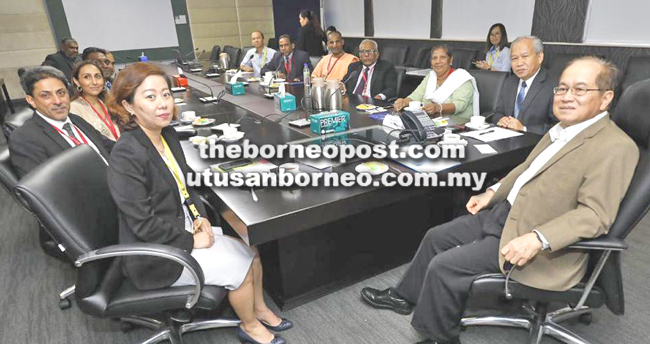 Uggah (right), Lim (left), Shankar (second left), Ngenang (second right), Linggam (third right) and others during the courtesy call. “This reflects the Gabungan Parti Sarawak (GPS) government’s policy of inclusivity towards the various religions and beliefs of the people in Sarawak,” said Uggah, before presenting the cheque to Sri Mahamariamman Temple president Shankar R.P. Asnani. Uggah (centre) presents a RM2.3 million mock cheque to Shankar (third right) while others look on.